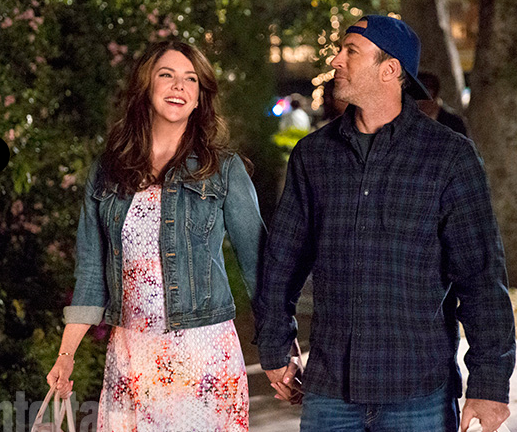 -EW just unveiled their Gilmore Girls return cover and I’m in love. Meanwhile, the showrunner says of Melissa McCarthy: “I can get her in and out in two hours.” Methinks it’s too little, too late, but we’ll see. -I can barely pick out the One Direction guys from a lineup but that didn’t stop me from falling down a crazy fake baby conspiracy rabbit hole today. I’m not sure what’s crazier — the theories or the actual public story. Who announces to People he’s expecting a kid with a fling when she’s only 11 weeks along? Why are they passing off baby pics from random bloggers as their own? What’s with all the queerbaiting? I don’t understand any of this, but I do know this: if I’m ever falsely accused of a crime, I want the 1D fandom in charge of investigating the case. They’ve got receipts! –Russell Crowe tries to prove he’s funny enough to host SNL in these new promos. It doesn’t work. -You can watch the first four minutes of the Orphan Black season premiere here. -This is adorable: Tom Cruise has given Kristen Dunst a coconut cake every Christmas since they shot Interview with a Vampire. -Ruh roh! Jennifer Lopez‘s new feminist song is also produced by Dr. Luke. -Wait wait wait — Ryan Reynolds is in talks to star in the adaptation of The Rosie Project?! Seeing as the main character is a nerdy, OCD-plagued professor, this movie might already be in trouble. –Aisha Tyler’s Reddit AMA was wonderful. –David Duchovny and Stephen Colbert had fun trying to make the CBS person in charge of bleeping out swears work overtime. -I feel such weird pride for the Amell boys, as if somehow had a hand in their success. I once waved to one of them while crossing the street. Does that count? –Cameron Diaz gushed about the “real love” she’s found with her husband. Which is sweet — until you remember he’s one of the Good Charlotte guys and everything gets all confusing again.